they look easier to make than they are. 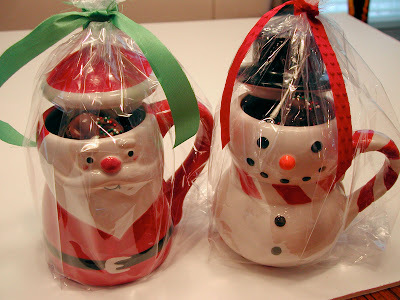 I found these cute containers at the Christmas Tree Shop. I usually find something there every year. I filled them with milk and dark chocolate covered pretzel nuggets. Not the easiest pretzel to cover. Because they are so small it was difficult get them out of the chocolate and to let them drip after dipping. 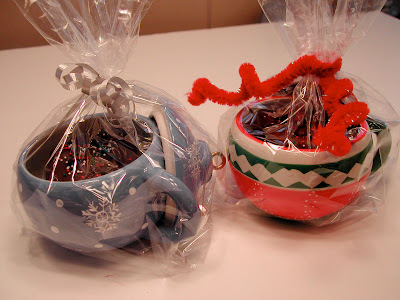 I filled these ornaments and small holiday trays with large sour dough pretzels dipped in dark chocolate. These were a little easier to manage. Oh did I tell you that my first batch all turned gray?? Yeah, what a nightmare. I guess it had something to do with not tempering the chocolate. I have never tempered chocolate before and never really had a problem. I think I just left the chocolate on the heat (in the double boiler) too long. So anyway, I had to unwrap everything and start all over again. What a back ache~ literally! My back is killing me and this disaster didn't help. Oh well, at least they turned out nice in the end! I hope everyone had a Merry Christmas and a Happy Holiday! Ahh so sorry about the chocolate issue in the beginning - nurse your back!! 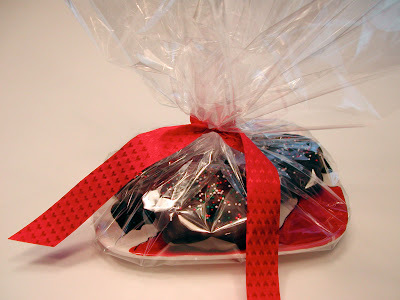 Your treats look so festive - hope you had a good holiday! I feel you on the back ache. I made chocolate covered pretzels the other night, and it was horrible. These look like great gifts. Wish I lived close by so I could get my hands on one! Glad everything turned out great, after the gray incident! Delicious and beautiful! How wonderful! And how your back feels better soon!